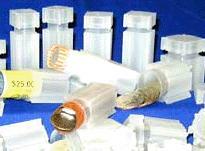 Coin tubes are an economical and convenient way to store and protect large quantities of coins. Each plastic coin tube will hold an amount equivalent to a roll of coins of a specific denomination. They come in sizes to fit pennies, nickels, dimes, quarters, half dollars and several sizes for the different sizes of dollar coins. These plastic tubes are available in both round and square. They are all round inside of course, but some are made square on the outside to make them easier to stack. These would be ideal for storing bulk coins in a safe deposit box at your bank. They also come in both clear and opaque. Each plastic tube is just a few cents each (from $.15 to $.40) and are made of an inert material that is safe for long-term storage of coins. One draw-back that I can think of for storing your coins in tubes is the fact that you cannot see the coins, except for the edges, without removing the coin from the tube. So it would probably not be a good idea to store coins in these tubes that you need to look at or examine often as the process of removing and replacing them in the tubes could cause scratching and scarring.